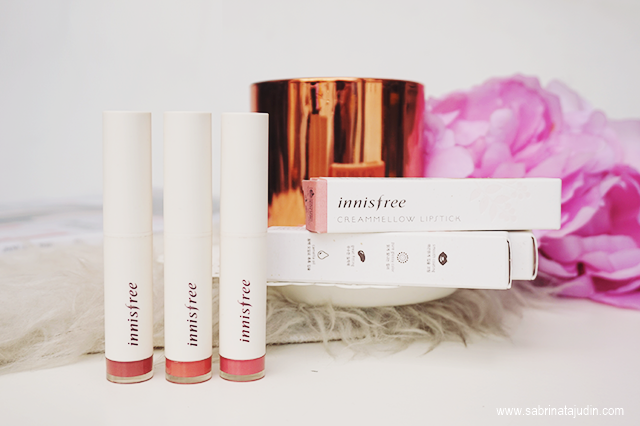 Other than skincare, Innisfree has some makeup products too. I have been wanting to try this for the longest time. The advert got me excited. Looking at Yoona cute lips wearing this. I'm sold. So I got a chance to shop at Althea last few months and they have these for a pretty good deal. I went and grab some. 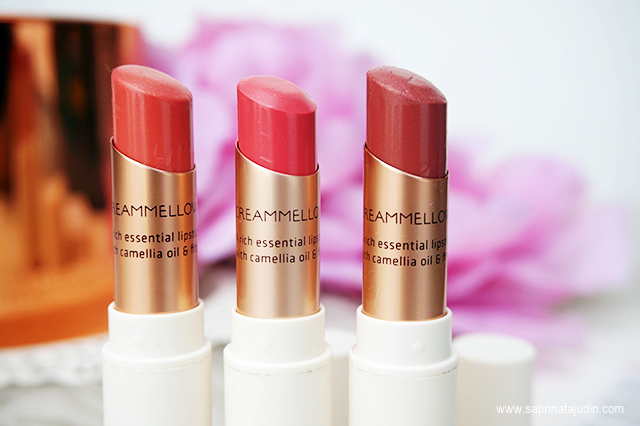 These lipsticks are describes as a sparkling high glossy gel base to make your lips looks voluminous. 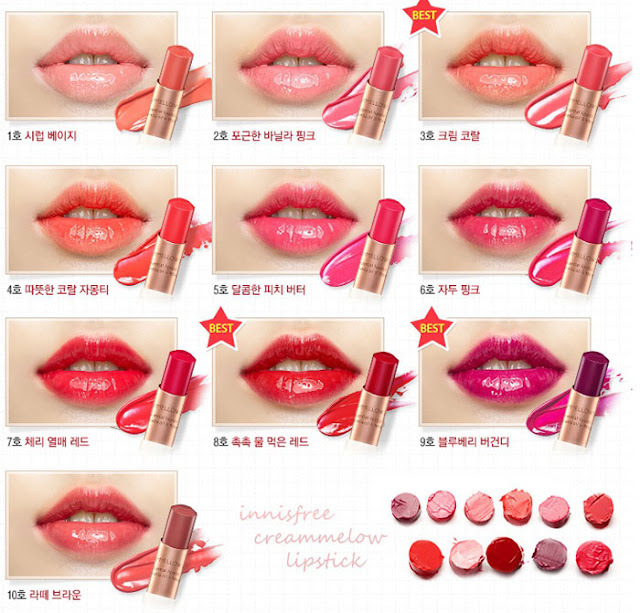 It has a high adhesive fitting formula that covers lips softly and keep the color stays longer.It has layers of moisture to keep your lips from drying. Insufed with a rich essential camellia il too. The tube are made from matte finish plastic with a rose gold steel inside. They are 3.5g each and they are made from Korea. They have 10 color options to choose from. 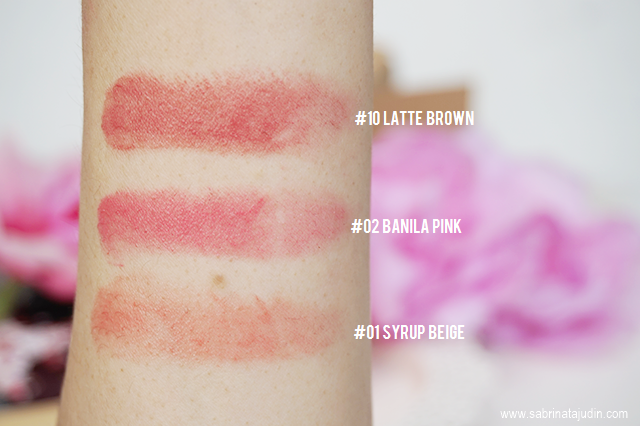 Here I got 3 colors, #01 Syrub Beige, #02 Banila Pink & #10 Latte Brown. My thoughts & review. I was not a fan of these lip products actually. The name "Creammellow" actually the main thing that attracts me. I thought these lipstick were going to be a creamy pigmented kind of lipstick but actually these lipsticks are tinted kinda lippies if you know what I am saying. It reminds me of the Revlon Lip Butter but a bit more pigmented. It has a slight sticky feeling too. The first color that I got is #01 Syrub Beige. From the picture above it looks like a Milky Peach to me. Reminds me of a lighter version of Athens NYX SMLC. But what I got is shiny peach with a bit of orange undertone. The second is #02 Banila Pink, I thught it was going to be a milky pink shade but hat I got is a medium pink tint shade. The late one is #10 Latte Brown. A pretty beige color with a red undertone. Pretty nice. But all of them has a shiny texture to it. Just not my preference. 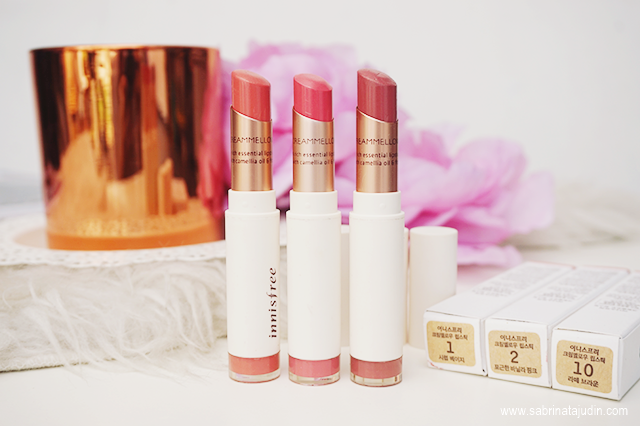 If you like natural color tint lip sticks, this might be for you. I might just stick to my matte lip cream and gel tint lip products that I usually go for. Overall it is a pretty good lipstick as it is very hydrating, just that the finish of these lipsticks are just not my type. I freaking love the packaging. Love how they comes in a recycle box and the color guides are on the bottom of the lipstick. I bought them at Althea Korea for RM33.00 each instead of RM56.00.